I am so excited to share the Master Your Money Super Bundle with you today because it is a crazy good deal! If you are ready to gain control of your finances once and for all then this is for you. Master Your Money Super Bundle – your personal library of $1206.41 worth of financial resources to help you pay off debt, budget like a boss, and reach your financial goals. 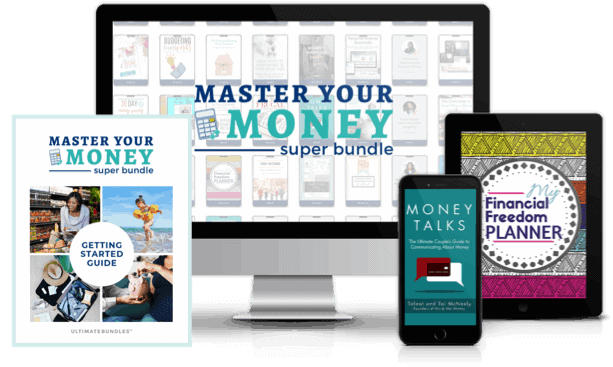 Get 46 eBooks, eCourses, and printables on paying off debt, budgeting like a boss, and reaching your financial goals with the Master Your Money Super Bundle. This bundle is on sale 97% off for 6 days only. It’s a phenomenal deal at just $37 for 46 resources worth over $1200. If you get your bundle by the end of today, you’ll also the cheat sheets for free. The cheat sheets are designed to help you review all the bundle’s material in less than half the time, and then dive deeper into the topics that are most interesting to you – a $10 value!…only they’re worth a lot more than that if they help you use the resources in your bundle. Let me tell you, the cheat sheets are such a practical addition to the bundle – since I got to access everything early, I’ve been getting through the bundle faster than I ever have before! Check out all the details here and get your bundle + the bonus when you buy before midnight.